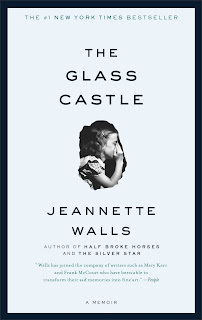 The Glass Castle: A Memoir , by Jeannette Walls was the last of my Facebook Challenge reads that I had accepted. You might recall that the first of every year I invite a certain number of people to make a suggestion for a book that I then have to read in the coming year. In 2015 I invited 4 people to make such a suggestion and Shonya "assigned" me this book as one of my challenge reads. I finished it several weeks ago and meant to write about it immediately, because it was something of a haunting read. I wanted to write my thoughts on it out of my system but instead I walked away from it and let them languish. (Whoops.) 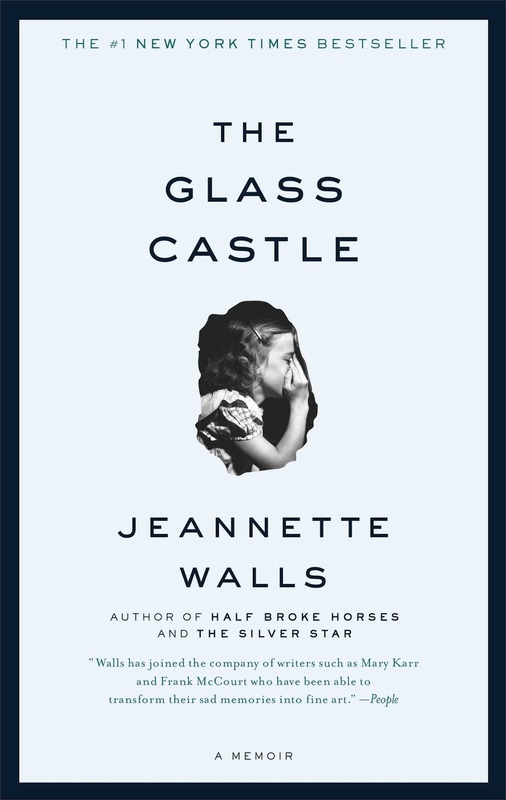 If you aren't aware of this story, know that it's a New York Times Bestseller and a memoir by Jeannette Walls. In this book she shares her growing up experience with a set of parents who might by all accounts be considered deadbeats, but whom she really adored as a young child. Their family moved all over the country during Walls' childhood, due to her father's inability or interest in holding down a job. Both of her parents enjoyed the concept of having a free spirit that could wander about at whim and fancy. Doing whatever pleased them most seemed to be their life goal. The problem what that is that you can't do just anything you like when you have three children in your care. Jeannette and her siblings knew what it was like to be and/or feel alone, to be freezing cold in the wintertime, and to be hungry year 'round. As Jeannette comes of age, she begins to feel the urge to make something of herself. She wants to take more care of not just her own person but of her siblings too. She set goals for herself and worked hard at them. I would say that Jeannette Walls has done a great job striking out on her own and pursuing hard goals. She has succeeded in much that she has put her hands to, but never quite lost the respect a child always feels for their parent, regardless of how they are or are not cared for. Walls had a challenging set of parents to write a story about but she does so in such a fashion so as to provoke a sense of compassion in the reader. I'm not quite sure how she managed that as I'm typically not very compassionate towards those who absolutely refuse to work. I can't say that I understand her father at all, but she explains him so that I feel sorry for him, to some extent or another. One thing that I really appreciated her saying was that people with brokenness in their life have some of the best stories to offer. I think there's truth to that. We're all broken but not all of us admit it. If we were to do so, honestly, our stories would be vastly more interesting. We are able to connect with the Walls family in part because she lays all things bare. With nothing hidden, you can find places to identify and connect with and that's pretty amazing. This isn't a bright and peppy book, by any stretch of the imagination, but it is an interesting one. I think it would make a good book club read because the characters contained herein definitely stand out. Plus there's a lot of social topics to be discussed as a result of reading and thinking about the Walls family story. Anyway, if you like memoir and you like being provoked to thought, then this is a title to be considered. 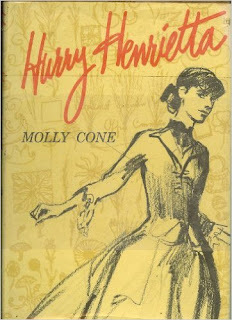 Another title which I devoured in an afternoon (it's short enough to do so) was Hurry Henrietta by Molly Cone. I picked this one up at a used bookstore simply because I thought the premise sounded interesting. It was described as a book about a young Jewish girl who was the oldest of five daughters. Her siblings all grew up and fell in love but she never married, being very focused on educational pursuits instead. Come to find out, this is a true story about Henrietta Szold who you can read about here. She was a U.S. born Jewish Zionist leader and founder of Hadassah, the Women's Zionist Organization of America. Hurry Henrietta tells a very condensed version of her life story. Author Molly Cone says of it, "This story leaves out a great many things - you cannot really call it a biography - for it picks and chooses among the events of her life to find her "true" story. Call it only a story." That's probably the most honest disclaimer I've ever seen in a book! That is also a very good description as a great many liberties are taken when it comes to picking and choosing which parts of Henrietta's life to focus on. This story is something of a hodge podge of random bits and pieces from Henrietta's life and it is not very neatly stitched together at that. While I learned who Henrietta Szold was and noted a few interesting things about her personality, there wasn't a great deal more to it than that. I think Cone's idea was to clue you in on Henrietta's existence. In so far as that, she did a great job. As you might gather, I wasn't enamored with the book. It certainly wasn't what I was expecting to discover when I purchased it to read. Sometimes you have to take a gamble and on this one I learned about someone I had never heard of before. In my mind, that makes this book which wasn't a total waste but I don't know that I'd go about recommending it as being the greatest thing ever. If you come across it and her story sounds a little bit compelling, it makes for an interesting and quick read. Last night I was updating my list of books read. I am so behind on posting what I have read. And I can't stop reading!! Ack! Looking forward to more snippets. Ahhh, The Glass Castle. (nods sagely) Glad you got around to reading it. I wanted so badly to talk to someone about that when I finished it! Then I got online, read about the Wells family, discovered the "sequel" Half Broke Horses, and continued on my little case study of the Wells family. The father frustrates me, yes, but the mother frustrates me just as much (if not more). Reading Half Broke Horses (the story of Jeanette's maternal grandmother) made me even more frustrated with the mother. Soooo many thoughts you're bringing back to my mind!! And as our family has recently started serving meals to the homeless once a week, it reminds me of their CHOICE of homelessness. The Glass Castle has been on my reading list forever. I need to get to it!